The latest information issued by NASA's Jet Propulsion Laboratory suggests that this comet could get as bright as magnitude -11.6 on the astronomers' brightness scale; that's as bright as nearly full moon! That would also be bright enough for Comet ISON to be visible during the daytime. The 1843 comet passed only 126,000 miles (203,000 km) from the sun's photosphere on Feb 27, 1843. Although a few observations suggest that it was seen for a few weeks prior to this date, on the day when of its closest approach to the sun it was widely observed in full daylight. Positioned only 1 degree from the sun, this comet appeared as "an elongated white cloud" possessing a brilliant nucleus and a tail about 1 degree in length. Passengers onboard the ship Owen Glendower, off the Cape of Good Hope described it as a "short, dagger-like object" that closely followed the sun toward the western horizon. In the days that followed, as the comet moved away from the sun, it diminished in brightness but its tail grew enormously, eventually attaining a length of 200 million miles (320 million km). If you were able to place the head of this comet at the sun's position, the tail would have extended beyond the orbit of the planet Mars! By Sept. 14, it became visible in broad daylight and when it arrived at perihelion on the 17th, it passed at a distance of only 264,000 miles (425,000 km) from the sun's surface. On that day, some observers described the comet's silvery radiance as scarcely fainter than the limb of the sun, suggesting a magnitude somewhere between -15 and -20! The following day, observers in Cordoba, Spain described the comet as a "blazing star" near the sun. The nucleus also broke into at least four separate parts. In the days and weeks that followed, the comet became visible in the morning sky as an immense object sporting a brilliant tail. Today, some comet historians consider it as a "Super Comet," far above the run of even Great Comets. Great January Comet of 1910 — The first people to see this comet — then already at first magnitude — were workmen at the Transvaal Premier Diamond Mine in South Africa on Jan. 13, 1910. Two days later, three men at a railway station in nearby Kopjes casually watched the object for 20 minutes before sunrise, assuming that it was Halley's Comet. Later that morning, the editor of the local Johannesburg newspaper telephoned the Transvaal Observatory for a comment. The observatory's director, Robert Innes, must have initially thought this sighting was a mistake, since Halley's Comet was not in that part of the sky and nowhere near as conspicuous. Innes looked for the comet the following morning, but clouds thwarted his view. However, on the morning of Jan. 17, he and an assistant saw the comet, shining sedately on the horizon just above where the sun was about to rise. Later, at midday, Innes viewed it as a snowy-white object, brighter than Venus, several degrees from the sun. He sent out a telegram alerting the world to expect "Drake's Comet" — for so "Great Comet" sounded to the telegraph operator. This painting of Comet Ikeya-Seki, visible during the day, was done by now-retired Hayden Planetarium artist Helmut K. Wimmer and was based on a description made by Hayden's Chief Astronomer, Ken Franklin, from an airplane hovering over West Point, New York. It was originally published in the February 1966 issue of Natural History magazine. Republished with permission. 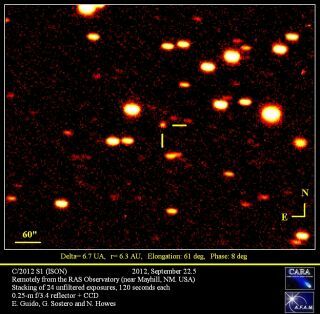 From Japan, the homeland of the observers who discovered it, Ikeya-Seki was described as appearing "ten times brighter than the full moon," corresponding to a magnitude of -15. Also at that time, the comet's nucleus was observed to break into two or three pieces. Thereafter, the comet moved away in full retreat from the sun, its head fading very rapidly but its slender, twisted tail reaching out into space for up to 75 million miles (120 million km), and dominating the eastern morning sky right on through the month of November. In the days that followed, Comet West displayed a brilliant head and a long, strongly structured tail that resembled "a fantastic fountain of light." Sadly, having been "burned" by the poor performance of Comet Kohoutek two years earlier, the mainstream media all but ignored Comet West, so most people unfortunately failed to see its dazzling performance. Michael Jager and Gerald Rhemann photographed comet C/2006 P1 (McNaught) from Austria in twilight 45 minutes before sunrise on Jan. 3. Rhemann told SPACE.com they used 7x50 binoculars to find the comet. They estimate that today (Jan. 5) it shone at magnitude +1 and they expect to see it with the naked eye next week. Image used with permission. Comet McNaught, 2007 —Discovered in August 2006 by astronomer Robert McNaught at Australia's Siding Spring Observatory, this comet evolved into a brilliant object as it swept past the sun on Jan. 12, 2007 at a distance of just 15.9 million miles (25.6 million km). According to reports received from a worldwide audience at the International Comet Quarterly, it appears that the comet reached peak brightness on Sunday, Jan. 14 at around 12 hours UT (7:00 a.m. EST, or 1200 GMT). At that time, the comet was shining at magnitude 5.1. Some observers, such as Steve O'Meara, located at Volcano, Hawaii, observed McNaught in daylight and estimated a magnitude as high as -6, noting, "The comet appeared much brighter than Venus!"